When market prices for copper rise or fall, the miners that pull the ore from the earth feel no difference in their pockets. They still struggle to buy groceries or their children’s school uniforms. “You always know when it is payday because there is traffic and Chingola runs out of fuel,” said Arthur Msukwa, chairman of the Chingola Association for Ex-Miners. Many miners in Chingola have cars, but rarely drive them as they wait for an unreliable monthly payday to get petroleum. Zambia is facing its worst economic crisis in more than ten years, but the miners that live and work in Copperbelt province in northern Zambia have felt an economic strain for decades. It is in this region where Zambia’s biggest industry functions, depending on natural resources. It has gotten worse as declining prices forced companies to lay off workers. Kangwa Chileshe was an assistant plant manager at Konkola Copper Mines (KCM) in October 2015 when he received his 30 days notice termination letter. That same month, Humphrey Gondwe received his notice as he worked in KCM’s quality assurance unit. 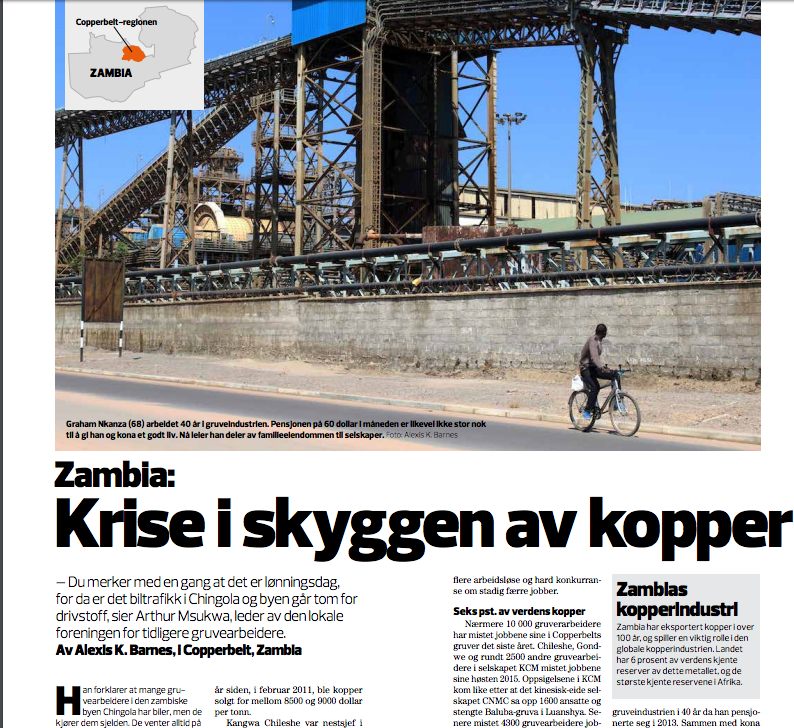 Zambia has exported copper for over a century. It’s home to 6 percent of the world’s known copper reserves and plays a critical role in the global copper mining industry as it contains the largest known reserves of the material in Africa. Chileshe and Gondwe joined some 2,500 laid off KCM miners in late 2015. These KCM lay offs came shortly after Chinese-owned CNMC Limited laid off 1,600 employees and suspended operations at the Baluba mine in Luanshya. Mopani Copper Mines, backed by Swiss-owned company Glencore, suffered the cutting of 4,300 jobs and halting of production operations. Following Mopani’s decision, Mines Deputy Minister Richard Musukwa said that the decision to lay off workers is not in the interest of the country but its shareholders abroad. “The government is determined to save the jobs and sustain mining operations in the best interest of the country,” he said. In the current Zambia election season, top candidates frequently make promises of job restoration for the beleaguered community, journeying from Lusaka to the cities that dot the copperbelt region. On Chingola’s main road, a massive poster of Hakainde Hichilema shows the smiling candidate shaking hands with miners. Big, white letters promise a “better economy” and “more jobs for miners”. Graham Nkanza, 68, joined the mines in 1973 when it was still RCM. He has worked throughout the copperbelt region, from Kitwe to Chingola, where he retired after a 40-year career. He now uses the land, where he resides with his wife, to host engagement parties, known as “kitchen parties” in Zambia, and weddings. He does this because he cannot live on his 600 kwacha ($60 USD) monthly mining pension. He remembers when the city was known as “The Cleanest City” and the mining company invested in the community and has seen a social decline as ownership changed hands. Prior to privatization in 2000, Zambia Consolidated Copper Mines Limited (ZCCM) monopolized the industry and operated mining divisions that were later sold as independent companies. As ownership switched from Zambians (ZCCM) to Indian corporations (KCM), less focus was placed on social services. ZCCM held weekly football and cricket tournaments. They supported city infrastructure and local resources like clinics and entertainment clubs. Now, city refuse is rarely picked up and water supply is erratic. Stadiums, former dance and racquet clubs sport crumbling facades and KCM painted block letters. Deep potholes create traffic delays on the streets that surround the multi-million dollar mine. Although the economic outlook for Zambia is grim, many in the mining community said this downturn does little to affect the already poor communities. Zambia faces the same challenge most countries that depend on natural resources do, taxation and lack of diversification. Taxing a natural resource helps a government create a savings that will sustain a nation and it’s economy long-term. When mines throughout the Copperbelt privatized, the government relinquished many tax concessions. Because the nation’s economy lacks diversification, a fall in copper prices further depreciates the kwacha, decreases taxation revenue and increases unemployment. Growth in 2015 fell to 3.7 percent and is estimated to drop to 3.6 percent in this year from a previous annual average of 7 percent between 2010 and 2014. Copper prices reached their lowest level in more than seven years at $4,595/ton in February 2016, as demand from China decreased. In February 2011, copper sold between $8,500 and 9,000/ton. The effects of this decrease in production of Zambia’s biggest export, 59.7 percent according to African Development Bank statistics was further compounded by a Zambian kwacha depreciation and electricity shortage crisis that leave much of the nation in scheduled darkness. With these compounded problems, the nation’s workforce feels hit the hardest. It doesn’t matter if copper prices are at a $10,000/ton high or $4,000/ton slump, miners and the mining community struggle.